In September 1906 a riot broke out in Atlanta, in response to unfounded allegations published in the city’s newspapers that a group of black men had been assaulting white women. Thousands of whites roamed the streets damaging black businesses, assaulting and severely beating African-Americans. 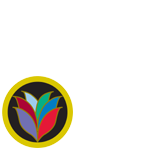 It is estimated that twenty-five to forty African-Americans were killed. The causes of the riot were more subtle and complex than the newspaper reports of violence. Since Emancipation, Atlanta had become a city where African-Americans could achieve middle class success. Although within the constraints of segregation, black men and women in Atlanta owned businesses, built stately homes, educated their children and held membership in social clubs and charity groups. Black wage workers saw their neighbors achieve higher status and they too expected improvements in their conditions. White anger rose in reaction to African American progress and the growing black middle class, increasing racial tension in the city. The gubernatorial election of 1906 also contributed to racial tension. Both of the candidates for the Democratic nomination, M. Hoke Smith and Clark Howell, ran campaigns painting black Atlantans in a negative light, stirring up fear among whites that their way of life was threatened by the black vote. This kind of explosive violence of the 1906 race riot called the terms of the Atlanta Compromise into question, and the philosophy of activists like W.E.B. Du Bois, who envisioned equal rights, grew in popularity. 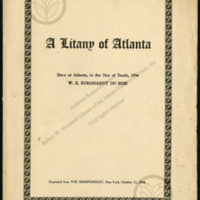 Du Bois' essay "A Litany of Atlanta" examines the failure of the Atlanta Compromise to protect African Americans from injustice. 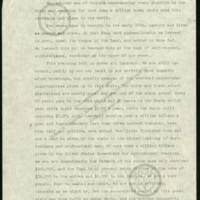 In this address, Du Bois directly relates the violence in Atlanta to the failure of the government, at every level, to give African Americans equal rights under the law. 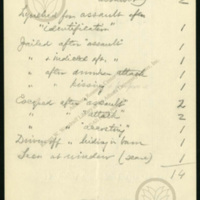 In these notes made after the Atlanta Race Riot, Atlanta University President Horace Bumstead lists the people assaulted, injured, jailed, or otherwise affected by the riot. One person is listed as jailed for "kissing."